With this release we bring back features and settings that were missing at the initial launch of the completely rebuilt Hill88 for iOS7, improve workflow and performance, and of course iron out some bugs along the way. Without further ado let’s see what’s new and improved in this release. The first feature back in this new release (Pro only) are smart links for task notes and comments. 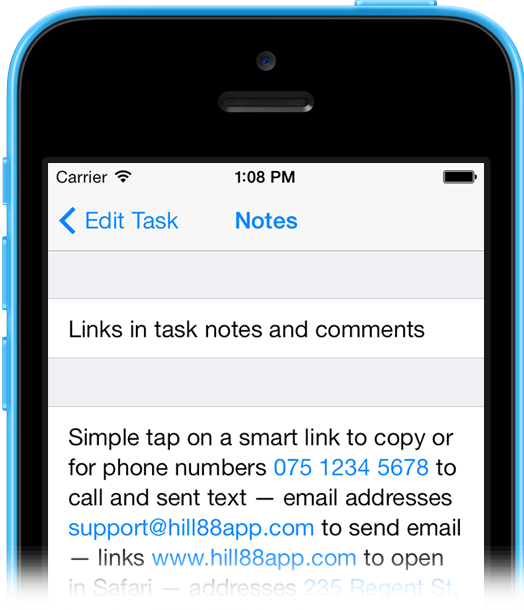 Smart links turn links, addresses, email addresses and phone numbers in direct actions when tapped on. Google Chrome browser as well as preference settings will be added in a future version. In order to adjust Hill88 as much as possible to your personal preferences and workflow, we have improved existing, and added new settings. In the previous version (2.0.1) we added one single setting for scrolling to tasks that have been added or modified. Based on user feedback we found that it would be great to have separate settings for new and modified tasks. No matter if you are one of our users who love to see all the details about their tasks at once, or one of those who love pure simplicity, we have you covered with our new task list settings. These new settings allow you to customise your task lists from super simple to showing all task related details and anything between. This setting allows you to set a default assignee for new tasks. The default assignee is either you or another active user depending on which task list is currently shown when adding a new task. When disabled, any new task will be un-assigned by default. 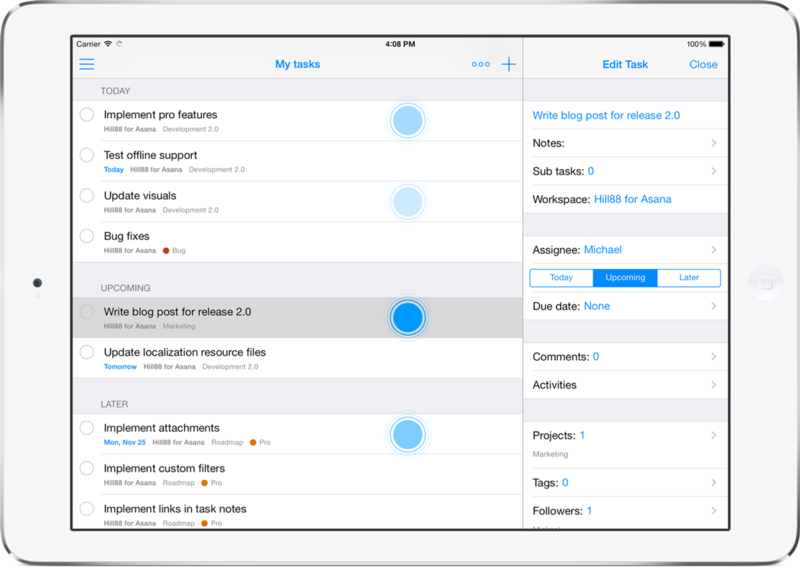 New in this version is the ability to un-assign a task from an assignee. Along this addition, we have also updated the assignee status, which resets now when changing the assignee and is disabled, if you are not the set assignee. However, even the control is disabled, it will still show the set assignee status, which is quite handy to see the current status for tasks assigned to other users. You might have experienced some delay when a task is showing in the edit pane on the right hand side and you selected a different task from the task list. In this version, we have massively optimised the process of switching between tasks, which happens now instantly without any delay. You can now open a task, edit it and tap on another one. The edited task gets saved and synced with Asana. Product Guy with focus on productivity. Maker of Context (@useContext) and previously Hill88 for Asana (@Hill88App).